ProMISe operates in two phases by inferring the probability of mRNA (miRNA) being the targets ("targets") of miRNA (mRNA), taking into account the expression of all of the mRNAs (miRNAs) due to their potential competition for the same miRNA (mRNA). 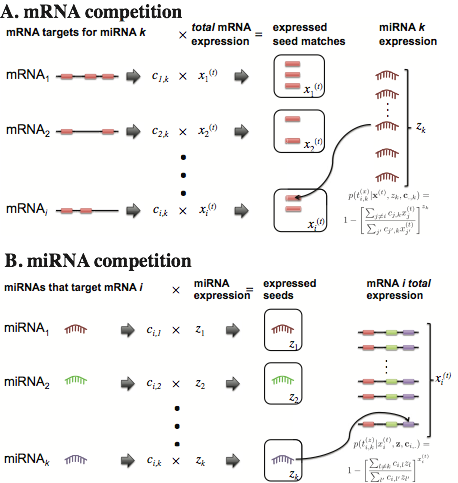 Due to mRNA transcription and miRNA repression events simultaneously happening in the cell, Roleswitch assumes that the total transcribed mRNA levels are higher than the observed mRNA levels at the equilibrium and iteratively updates the total transcription of each mRNA targets based on the above inference. 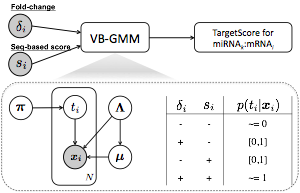 TargetScore is used to infer the posterior distributions of microRNA targets by probabilistically modeling the likelihood microRNA-overexpression fold-changes and sequence-based scores. 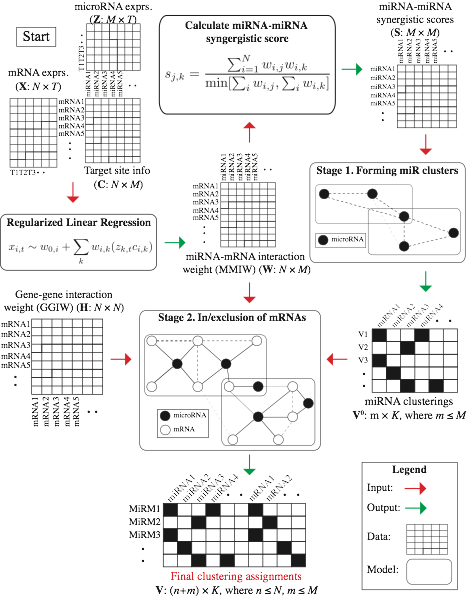 Variational Bayesian Gaussian mixture model (VB-GMM) is applied to log fold-changes and sequence scores to obtain the posteriors of latent variable being the miRNA targets. The final targetScore is computed as the sigmoid-transformed fold-change weighted by the averaged posteriors of target components over all of the features. Infer and discriminate RIP peaks from RIP-seq alignments using two-state HMM with negative binomial emission probability. While RIPSeeker is specifically tailored for RIP-seq data analysis, it also provides a suite of bioinformatics tools integrated within this self-contained software package comprehensively addressing issues ranging from post-alignments processing to visualization and annotation. You can download and install RIPSeeker from Bioconductor. PIIKA is a software pipeline implemented in R for analyzing data from kinome microarrays. I do not maintain this software. If you wish to use PIIKA for academic, non-commercial purposes, please e-mail here to obtain a license form. Li, Y., Arsenault, R. J., Trost, B., Slind, J., Griebel, P. J., Napper, S., and Kusalik, A. (April, 2012). 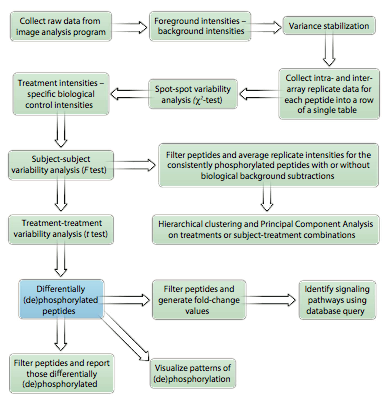 A Systematic Approach for Analysis of Peptide Array Kinome Data. Science Signaling, 5(220), pl2–pl2. Using miRNA-mRNA and gene-gene interaction matrices, Mirsynergy forms miRNA regulatory modules (MiRMs) via a two-stage clustering, where miRNA or mRNA can participate in more than one module and the number of modules are automatically determined by the running of the algorithm. The underlying algorithm of Mirsynergy is an adaptation of a recently clustering algorithm called ClusterONE (Cluster by Overlapping Neighborhood Expansion) by Nepusz et al. (2012). Li, Y. *, Liang, C.*, Wong, KC., Luo, J., Zhang, Z. (May, 2014). Mirsynergy: detecting synergistic miRNA regulatory modules by overlapping neighbourhood expansion. Bioinformatics. 30(18), 2627-2635. Gene expression is a combinatorial function of various factors such as copy number variation (CNV), DNA methylation (DM), transcription factors (TF) and microRNA (miRNA) regulation. At the technological maturity, large amount of high-throughput data recently became available. In particular, the occupancy of ~100 TFs measured by chromatin immunoprecipitation and sequencing (ChIP-seq) are available from Encyclopedia of DNA Elements (ENCODE); The Cancer Genome Atlas (TCGA) generated mRNA/miRNA expression profiles, DM, and CNV measured by sequencing/microarrays across diverse cancer samples. Accordingly, there is an intense interest in developing integrative model to take full advantage of the data. 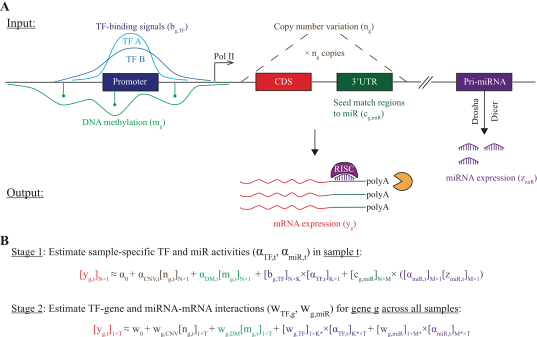 To this end, we developed RACER (Regression Analysis of Combinatorial Expression Regulation), which fits the mRNA expression as response using as explanatory variables the TF binding signals (TFBS) from ENCODE, CNV, DM, miRNA expression signals from TCGA. Briefly, RACER infers the sample-specific TF/miRNA regulator activities, which are then used as inputs to infer specific TF/miRNA-gene interactions. The two-stage regression circumvents the problem with integrating the non-sample-specific ENCODE TFBS with the sample-specific TCGA measurements.